Astronomers now have the first confirmed snapshots of what appears to be the aftermath of an asteroid collision in space. "When I saw the Hubble image I knew it was something special," said researcher Jessica Agarwal, a European Space Agency astronomer in the Netherlands. Astronomers suspect a rock maybe 10-16 feet (3-5 meters) wide slammed into a larger asteroid at speeds of about 11,200 mph (18,000 kph) with a detonation as powerful as a small atomic bomb, said researcher David Jewitt, an astronomer at the University of California in Los Angeles and leader of the Hubble observations. "We have directly observed a collision between asteroids for the first time, instead of having to infer that they happened from million-year-old remains," researcher Colin Snodgrass, a planetary scientist at the Max Planck Institute for Solar System Research in Katlenburg-Lindau, Germany, told SPACE.com. The smaller asteroid was vaporized, stripping material from the larger one. Pressure from solar radiation then swept the debris behind the remnant asteroid, forming a comet-like tail. 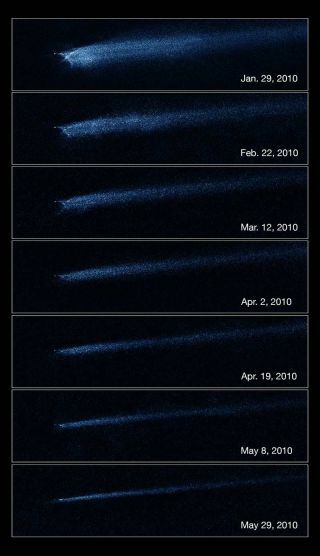 Hubble images suggest the nucleus of the object is 390 feet (120 meters) wide, with its tail containing dust grains 1 to 2.5 millimeters large, enough material to make a ball 65 feet (20 meters) wide. When it comes to why this object has such a weird X-shape, "think of throwing a brick into a swimming pool," Jewitt told SPACE.com. "The splash pattern will not be a smooth curtain, but a series of jets, filaments and other structures that reflect the shape of the brick, angle of impact and so on," he explained. "For the case of A2, neither the projectile nor the target are likely to have been spherical, so the 'X' arms probably reflect shape irregularities in an off-center impact." The two asteroids that created the object were probably familiar with collisions, since they were most likely born from impacts between larger asteroids tens of millions to hundreds of millions of years ago, the researchers said. Encounters between asteroids are thought to be common, with asteroids of modest size colliding into each other about once a year, Jewitt added. "Catching colliding asteroids on camera is difficult, because large impacts are rare, while small ones, such as the one that produced P/2010 A2, are exceedingly faint," he said. The two asteroids whose remains make up P/2010 A2 were unknown before the impact because they were too faint to be detected. Scientists did not witness the collision itself because it happened when the asteroids were in the same direction as the sun, but computer models suggest the collision took place around February 2009. "We expected the debris field to expand dramatically, like shrapnel flying from a hand grenade," Jewitt said. "But what happened was quite the opposite. We found that the object is expanding very, very slowly." The research will be detailed in the Oct. 14 issue of the journal Nature. These findings give new clues as to how asteroids behave when they smash into each other and how the debris from these impacts contributes to the dust that pervades the solar system. "These observations are important because we need to know where the dust in the solar system comes from, and how much of it comes from colliding asteroids as opposed to ?outgassing' comets," Jewitt said. "We can also apply this knowledge to the dusty debris disks around other stars, because these are thought to be produced by collisions between unseen bodies in the disks. Knowing how the dust was produced will yield clues about those invisible bodies." Astronomers plan to use Hubble to examine the object again next year to see how far solar radiation has swept its dust back and how the mysterious X-shape nucleus has evolved. Future telescopes should find plenty of such asteroid crashes, with Jewitt expecting the planned Large Synoptic Survey Telescope to spot dozens of asteroid collisions shortly after they happen.